St. John Ambulance Nova Scotia has been your partner in first aid since 1898. 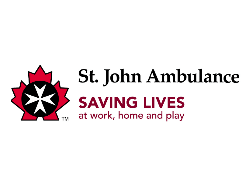 St. John Ambulance offers the most comprehensive, state-of-the-art first aid and CPR training programs for the workplace, the home and the community. Each year they train over 50,000 Nova Scotians & provide free first aid to high school students. St. John Ambulance’s mission is to enable Canadians to improve their health, safety and quality of life by providing training and community service. They strive to be the premier first aid training and community service organization in Canada. St. John Ambulance is proud to deliver reliable and sustainable community services in accordance with the organization’s mission. These services are provided by trained volunteers who recognize and respond to community-based health and safety needs. Community Services volunteers include uniformed members who serve communities across Canada, providing first aid and emergency response support, as well as improving the quality of life for people confined to a health care facility through their Therapy Dog visitation program. Their volunteers contribute millions of hours to Canadian communities each year. Under the guidance of our network of medical and health care professionals, St. John Ambulance is the national leader, setting the standard for training in first aid, CPR and other lifesaving skills. When you purchase a first aid kit from SJA, you help make Nova Scotians safer. Thank you for your support.